The world’s loneliest frog just found a date! Dubai: Shakespeare’s Romeo met Juliet at a ball, and it was a rather short romance. It’s not been the same for this Romeo. He’s had to wait 10 years to meet Juliet. This is the tale of two starcrossed frogs! 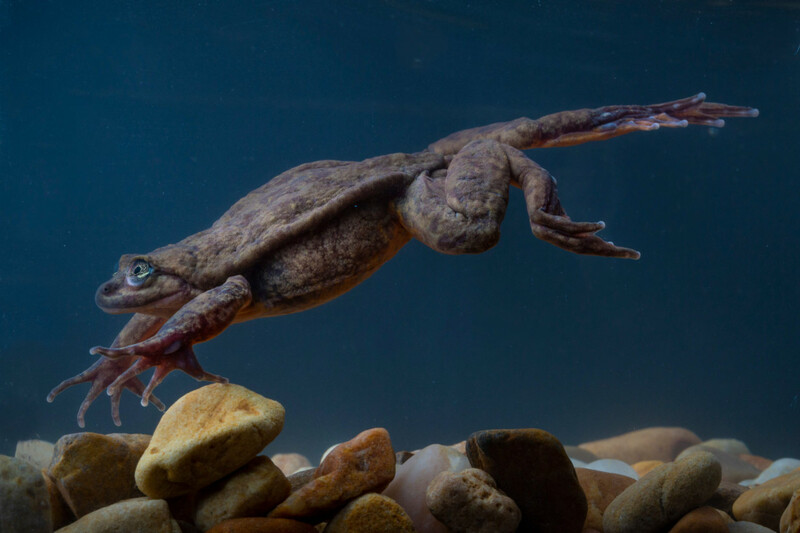 One of the last Sehuencas water frogs, named Romeo lucked out when scientists in Bolivia found a mature female in a cloud forest recently. Named Juliet in honour of the novel, the internet is overjoyed for Romeo whose online dating profile went viral last year. Is hyperactive Juliet willing and healthy enough to romance shy Romeo? We wait till Valentine’s day. According to a news report by CNN, that is when they meet. Held at the Museo de Historia Natural Alcide d’Orbigny in Bolivia, Romeo was thought to be the last of the classified ‘vulnerable’, Telmatobius yuracare species. Caught in 2008, Romeo’s search for a mate proved fruitless for nine years. This was when scientists opened a Match.com profile for him. It immediately went viral. 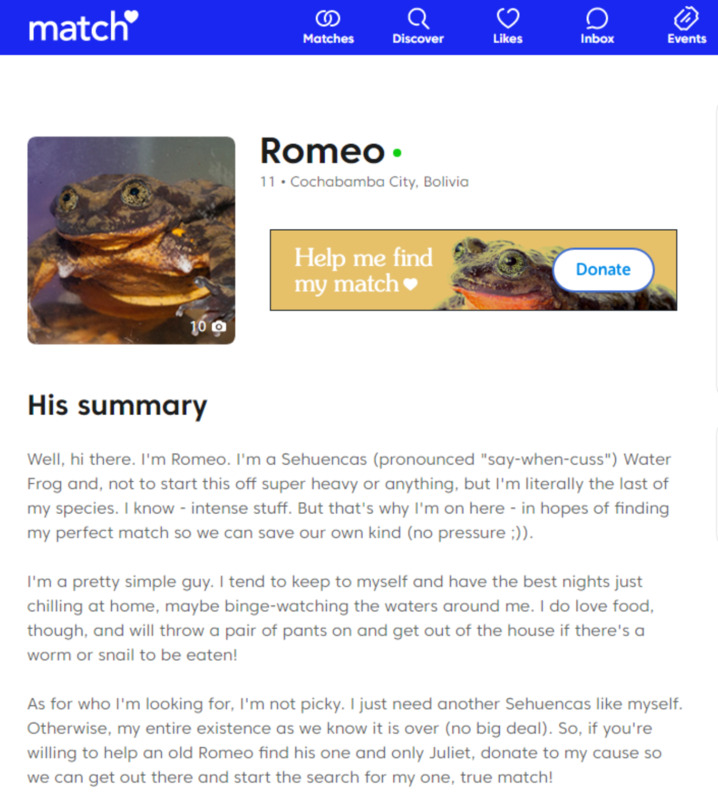 The profile outlined Romeo’s race against time to reproduce. His species was rapidly dwindling in number due to a combination of climate change, diseases and habitat destruction. As for personality, “Romeo is really calm and relaxed and doesn’t move a whole lot... He’s healthy and likes to eat, but he is kind of shy and slow”, Teresa Camacho Badani, the museum’s chief of herpetology told BBC News. All hope was fizzling out for Romeo, with only five more years in his 15-year lifespan to reproduce. He has his chance now, but it almost didn’t happen. In an expedition to a remote Bolivian cloud forest recently, scientists including head of the expedition Badani were losing hope. 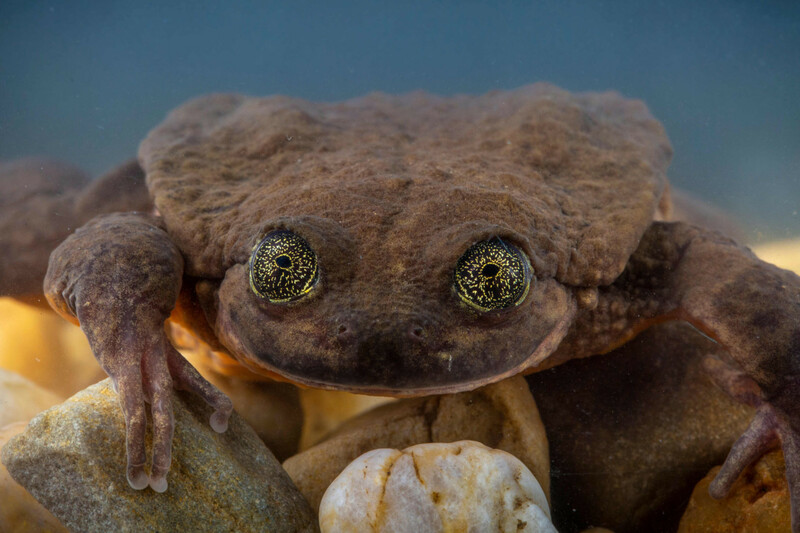 Badani told reporters: “We were tired, wet and disappointed ... Then I said, ‘Let’s do one more creek.’” The scientists followed it and, to their surprise, they found a Sehuencas water frog under a waterfall, and it was ... male. Determined to find more, they searched the surroundings and discovered two more males, and two more females. Of the two females, the reproductively mature one, they named, Juliet. She was brought back to the Natural History Museum along with her companions, where Juliet’s been trying to escape her tank.“Juliet’s really energetic, she swims a lot and she eats a lot,” Badani told BBC. “She has beautiful eyes,” said the museum director Ricardo Céspedes, according to CNN. The leads of our story are yet to meet. Juliet is in quarantine to make sure she doesn’t have the disease ‘chytridiomycosis’ which is known to kill the frogs, but is treatable. Badani told reporters that she hopes the opposites attract mantra will work for Romeo and Juliet. If all goes well, the couple will have their first date on February 14. Some social media users could not help but think Romeo and Juliet was a poor choice of names, considering how the Shakespearean drama ends. Others were just happy that Romeo had finally gotten a chance at love.